This week new evidence that former UN Secretary General Dag Hammarskjöld was murdered on 18th September 1961 has been covered by The Guardian. The Wikipedia entry about him already lists a number of "conspiracy theories". Swedish diplomat and economist who worked hard to promote peace tending to favor the independence of nations at a time when the world was locked in cold war and colonialism still characterized the business relationships between western corporations and developing nations. He intervened in the Suez crisis in 1957, angering Britain and France, and in the Bizerte crisis in 1961, angering France again. He morally supported newly independent Guinea, this time infuriating France who then whithdrew support for the UN Congo operation and encouraged French mercenaries to join the Congolese rebels fighting UN forces. Dag Hammarskjöld estabished the armed United Nations Emergency Force and generally strengthened the position of the United Nations considerably. 18 September 1961 the Douglas DC-6 transporting him and his delegation to cease-fire negotiations mysteriously crashed near the copper mining city Ndola (which is now in Zambia). The search and rescue mission was delayed. Official inquiries have failed to conclude on the cause of the crash and are inconsistent in certain details. These investigations were partly managed and influenced by the British military who were also there to protect British mining companies. 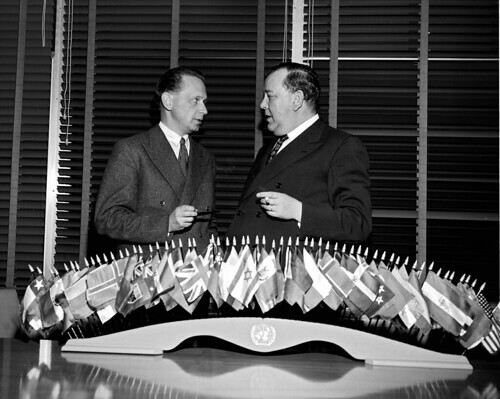 Dag Hammarskjöld (left), with his predecessor Trygve Lie today at UN Headquarters. Why was the rescue mission delayed? Why were local witnesses sent away, not interrogated? Why were the only survivor allowed to die unnecessarily in a poor local hospital? Why were poor reports on the cause of the crash rubber stamped? Didn't the British troops have conflicts of interest when they arranged the very peace negotiation Dag was to attend even while protecting the mining companies that supported the rebellion? "... in order to pay a tribute to this great man, now vanished from the scene, and to his colleagues, all of whom have fallen victim to the shameless intrigues of the great financial Powers of the West... the Government has decided to proclaim Tuesday, 19 September 1961, a day of national mourning." "Dag Hammarskjöld was on the point of getting something done when they killed him. Notice that I said, 'when they killed him'." Letter from Dag Hammarskjold top aides Conor Cruise O'Brien and George Ivan Smith detailing their version of the story; Guardian 1992. "[I have] documents purporting to be from an institution called the SA Institute of Maritime Research discussing the sabotage of the aircraft in which the UN Secretary-General, Dag Hammarskjold, died on the night of September 17/18, 1961." A metal plate fragment from the DC6, previously unpublished UN telegrams and many interviews with local witnesses have been conducted by Göran Björkdahl and The Guardian the past three years. The telegraphs (cables) reveal anger from the US, British and almost all other major powers on the security council towards the UN military operation in Congo and Dag's support for decolonization. The witnesses all tell of a small plane opening fire on the larger, crashing plane. "Hammarskjöld's DC6 was brought down [...] the motive was to maintain the west's control over Katanga minerals"
"It's clear there were a lot of circumstances pointing to possible involvement by western powers. The motive was there – the threat to the west's interests in Congo's huge mineral deposits. And this was the time of black African liberation, and you had whites who were desperate to cling on. Dag Hammarskjöld was trying to stick to the UN charter and the rules of international law. I have the impression from his telegrams and his private letters that he was disgusted by the behaviour of the big powers." Sources (if not as otherwise stated): Guardian / Dag Hammarskjöld unable to overcome Congo's troubled history, Guardian / Dag Hammarskjöld: evidence suggests UN chief's plane was shot down, Guardian / 'I have no doubt Dag Hammarskjöld's plane was brought down', UN cable 11 September 1961: UN frustrations with British behaviour spill over, Top secret UN cable 15 September 1961: Hammarskjöld rejects American criticism.